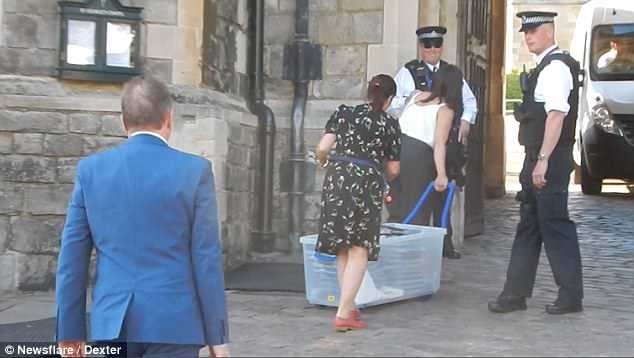 Prince Charles's plan for a strictly organic evening meal at his son's wedding appeared to leave some unsatisfied last night - as hungry guests ordered pizza to Windsor Castle. 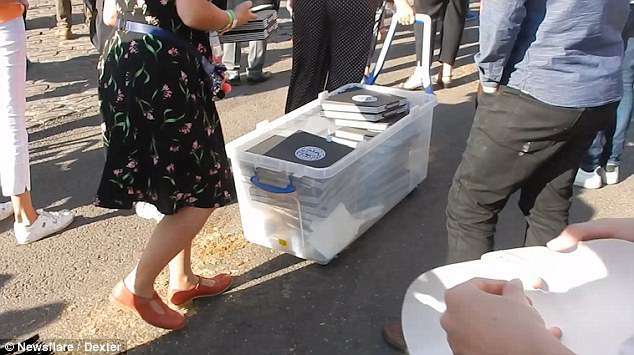 His 'spring meets summer' themed meal was set to feed about 200 guests from 7.30pm - but minutes before Pizza Express workers were seen hauling dozens of meals up to the gates. 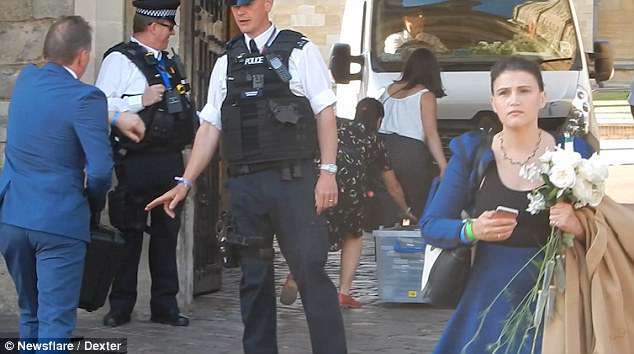 One woman was seen pulling a cart full of food through the cobbled streets of the Berkshire market town at 7pm. Another carried pizzas in her hands as the two made their way past bemused onlookers. After negotiating a path through royalists waving Union Jacks to commemorate the big day, the delivery workers were permitted access to the grounds by armed police. 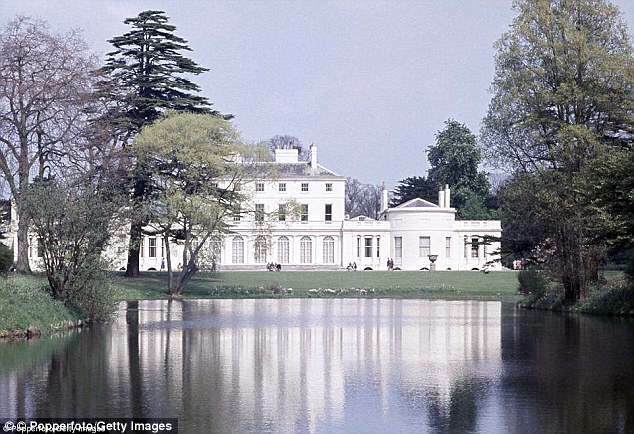 About 200 guests joined the royal couple for the reception at Frogmore House within the castle's grounds. The delivery was made after about 7,500 items of food were enjoyed at lunchtime where royal chef Mark Flanagan led a team of 25 cooks. That happy couple took an open-top Jaguar E-Type Concept Zero to the English country house, which is part of the Crown Estate. A double decker coach brought guests to the reception minutes after the pizza was seen being delivered. More than 120,000 flocked to Windsor to see the prince marry the former Suits actress. 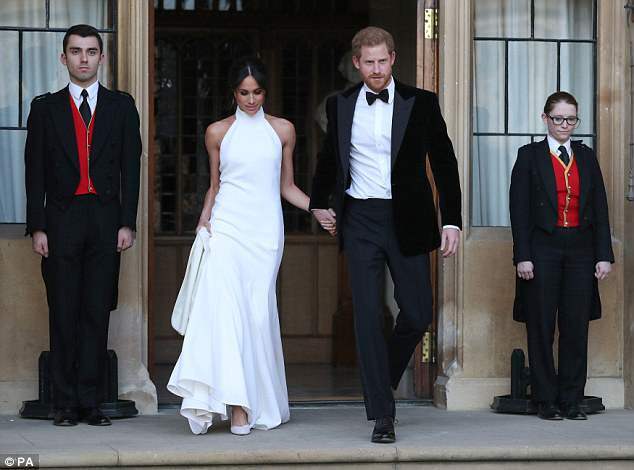 The couple invited more than 2,000 guests to the big day, including senior royals and Hollywood stars. 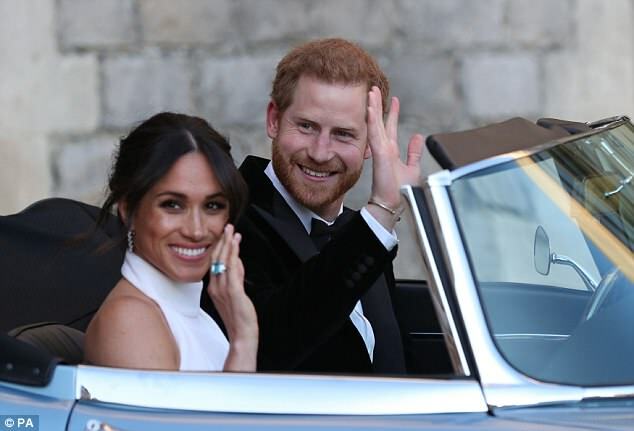 As thousands waved at the newlyweds in the street, Meghan returned the greeting and said 'wow' to her new husband, who said back: 'I'm ready for a drink now'. They then took a carriage procession through the town in an open-top Ascot Landau. Elton John, who sang at Princess Diana's funeral in 1997, performed at the lunchtime reception hosted by the Queen in a poignant nod to Harry's late mother, who died when he was only 12.